4 BR/2.5 BA home in Seacrest Beach. Bikes, beach chairs and toys included! 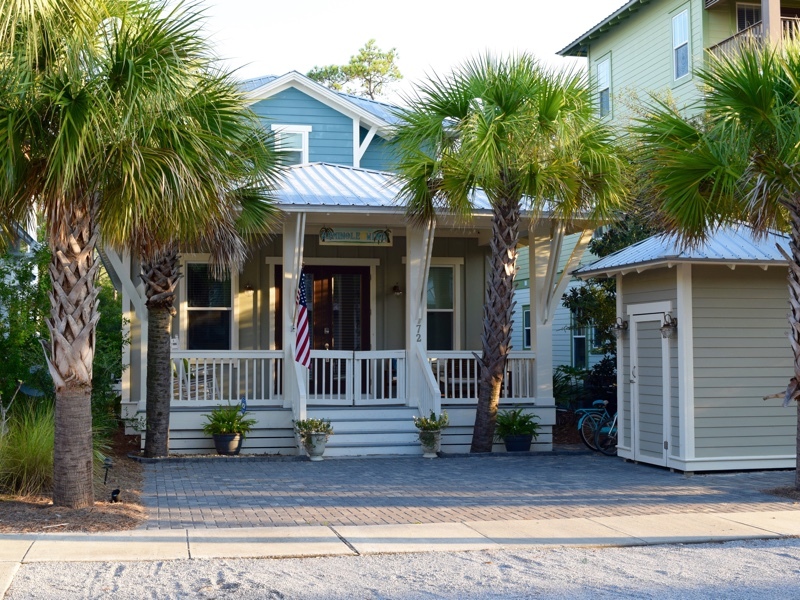 Three by the Sea is a beautifully decorated, two-story beach cottage located in the fun, family friendly community of Seacrest Beach. A newer construction home on a quiet street, this charming 4 bed/2.5 bath home comfortably accommodates 12 guests. Three by the Sea comes with all the amenities you’ll need for a fun and relaxing beach vacation. The home features an open floor plan downstairs with the kitchen area open to the living and dining rooms – making it great for entertaining. The kitchen is large and fully stocked – granite countertops, stainless steel appliances including a gas stove, large refrigerator, microwave and dishwasher, Keurig coffee maker, toaster, blender and plenty of cooking and baking supplies. The dining area has a table that seats 6, with an additional 5 seats at the kitchen bar. Enjoy hanging out in the main living room — playing board games and cards or watching movies and your favorite shows on the new 55” Samsung curved flat screen HDTV with sound bar and subwoofer. The house offers guests wireless high speed internet. The pull out couch in the living room can sleep two guests. The first-floor master suite is large and well decorated, featuring a king size bed, a large walk-in closet (with a pack-n-play), and a flat screen HDTV. The master bathroom has 2 sinks, a large walk-in shower with dual shower heads and wonderful water pressure! The master suite has direct access to the covered back porch. The second floor of Three by the Sea has three bedrooms, a full bathroom and a laundry area. The first bedroom has a queen bed, wall-mounted HDTV and lots of closet space. The second bedroom has a full bed, twin bed, wall mounted HDTV and lots of storage and closet space. The third bedroom is a kids dream! It includes a bunk with a twin on top and a full bed on the bottom. The full bathroom includes a nice size shower with tub. Down the hall is a laundry area with new front loading washer and a closet with cleaning supplies, beach towels and ironing board. The front and back porches are perfect for a morning coffee or an early evening Happy Hour drink. Enjoy meals and movies on the back porch – this space doubles as a second kitchen with a built-in gas grill and sink, along with a dining table and comfortable seating for relaxing and watching the new HDTV. There’s an outdoor shower just around the corner from the back porch. Also included with your house rental: 6 bikes (4 adult; 2 kids), 6 beach chairs; lots of beach toys like frisbees, footballs, buckets, shovels and sand toys. And no need to bring beach towels, we supply you with 10 beach towels. The community of Seacrest Beach has great shops, restaurants, a 12,000 square-foot pool, bike friendly streets and easy access to the white sandy beaches of 30A. The community offers a complimentary tram service (March-October) throughout the neighborhood and to the deeded beach access. The largest pool on 30a has waterfalls, fountains, two bath houses and plenty of lounge chairs. The community also offers a 1.3 mile walking trail that passes just behind the house. Located within walking distance to Rosemary Beach and Alys Beach, and about 10 minutes from Seaside, Seacrest Beach is one of the best beach communities on Scenic Highway 30A.